Local MSP Jenny Gilruth visited Rimbleton Primary School as part of an open day based around Developing the Young Workforce. Developing the Young Workforce (DYW) is the Scottish Government’s Youth Employment strategy to better prepare young people for the world of work and the school was keen to highlight its links with potential employers and to make links with the differing pathways available for young people. Ms Gilruth was delighted to enjoy a tour of the various activities taking place in the school by head teacher Andrea Gordon, her depute head and a number of the school’s Primary 7 house captains. She was taken on a flight to ‘The Moon’ by ‘Rimbee Airways’ in one class, with their ‘flight’ experience including check in, security, duty free and in-flight entertainment. Ms Gilruth added: “I was absolutely delighted to visit and take part in Rimbleton Primary School’s Developing Young Workforce Open Day. As a former teacher I know only too well how important teaching the next generation about the world of work is. 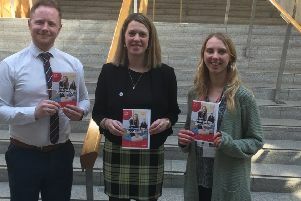 “It was a privilege to be invited to take part in some of the classroom activities- from checking in on my flight to the moon, to learning more about Hydropower, to answering tough questions about my role as an MSP – it was a really great example of the whole school community involving their young people in meaningful learning.